In 2007, St. Mary's Church experienced a fire that burned the entire sanctuary. More information about the tragic event can be found here. The few items that survived were the church bells and the Easter candle. It didn't take long for the dedicated church body to pull together and begin rebuilding. For the dedication ceremony, St. Mary's Choir with music ministers Jim and Vanessa Rauscher commissioned me to compose a piece for their SATB choir and orchestra with an option to have a piano accompanying version. The piece was based on Psalm 27:4-6 and Psalm 5:7. 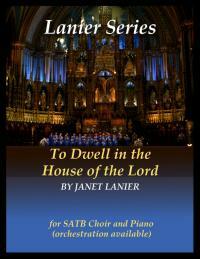 Watch a video of St. Mary's Choir performing the choir and piano version of this composition.